Since the field of psychology was established as a legitimate scientific discipline in the late 1800s, the world has been awed by a plethora of theories and discoveries related to human behavior and the brain. The pioneering work of psychology’s founding fathers Wilhelm Wundt and William James, who opened the first psychology research lab and offered the first psychology class in a university respectively, led to the rise of a number of other truly iconic figures who’ve helped us understand why humans act the way they do and what role the inner workings of the mind plays. Thanks to the likes of Carl Rogers, Erik Erikson, Sigmund Freud and Jean Pigaet, who’ve rightfully been lauded for their contributions to the field, we’ve seen major advancements in the treatment of a wide variety of mental, emotional and physical health issues. While nothing should be taken away from these immortalized figures, or the field’s other unforgettable individuals, there was one man who fully grasped the greatest psychological theories some 2,500 years ago. To fully illuminate the Buddha’s unparalleled knowledge of human behavior and the brain, we can now turn our attention to comparing some of history’s most important psychological ‘discoveries’ from the past 150 years, in chronologically order, to the words and teachings of the Enlightened One. Undoubtedly, it will become apparent to see why the Buddha will forever remain history’s most illustrious psychologist. Since James and Lange conceptualized their theory in the mid 1880s, a number of other prominent psychologists have developed their own emotional reaction models that closely resemble to the duo’s original theory. While there are slight differences between the James-Lange Theory, the Canon-Bard Theory of Emotion and the Two-Factor Theory of Emotion, each of them emphasizes the important role that bodily sensations play in the process of emotional reaction. Yet still, it was long before any western medical professional had ever thought about the process of emotional reaction when the Buddha discovered how one’s own sensations influence their reactionary ways. To illuminate the Buddha’s understanding of the role body sensations play in emotional reaction, we can turn our attention to the ancient meditation technique known as Vipassana. While there are a seemingly endless number of ways for spiritual seekers to meditate, the practice of Vipassana, which is believed by many to be the very technique taught by the Buddha himself, takes on a psychological approach and is primarily concerned with bodily feelings. Because the Buddha came to believe that our bodily sensations give rise to emotional reactions, and also because he realized that we develop cravings and aversions towards the positive and negative sensations when we experience repeatedly, he instructed individuals to develop equanimity towards both pleasurable and disturbing feelings. Although we may assume that external stimuli, such as people, circumstances and things, cause us to react in emotionally charges ways, the Buddha discovered that our reactions are in fact in response to our own bodily feelings. For these reasons, and also because it’s not possible to live with only positive sensations, the Buddha developed the technique of Vipassana which instructs individuals to consciously monitoring their sensations in a systematic way with the goal of developing indifference towards both their positive and negative feelings. Not long after William James and Carl Lange developed their infamous theory of emotional reaction, the now immortalized psychologist Ivan Pavlov accidentally discovered how reappearing stimuli in the environment, even if it had no previously associated meaning, could result in conditioned biological responses. It was while studying the digestive systems of his pet dogs when Pavlov began noticing how the canines would salivate at the sight of a co-worker whom they had come to associate with being feed that ultimately led the Russian psychologist to discover the all important psychological truth of conditioning. After first noticing the conditioned responses and switching the focus of his study, Pavlov was able to prove how dogs, and humans, respond to external stimuli in predictable ways by training his pets to link the sound of a bell to feeding time. For this discovery, Pavlov won the Nobel Prize in Physiology or Medicine in 1904. Some 30 years after Pavlov won the Nobel Prize, another iconic psychologist illuminated a second important type of human conditioning. It was in 1938, to be exact, when American behavioral psychologist B.F. Skinner published his celebrated book The Behavior of Organisms which outlined the process of Operant Conditioning. Where as Pavlovian Conditioning, or Classical Conditioning, shows how humans become conditioned to respond biologically to stimuli in the environment, Operant Conditioning shows how humans learn behaviors and develop conditioned habits based upon the rewards or consequences of particular actions. Today, it is widely assumed that each and everyone of us learns a considerable amount about behavior through this process of operant conditioning. A third important psychological theory that came about around the turn of the 20th century is credited to the man who may be history’s most widely recognized psychologist. Although the conceptual idea of an unconscious mind was previously discussed by German philosophers Arthur Schopenhauer and Eduard von Hartmann, as well as in ancient Hindu scriptures, Sigmund Freud is widely considered to be the discoverer of the unconscious. By looking within himself and analyzing his own mind, just as the Buddha did, Freud came to realize that numerous cognitive, emotional and physical processes function outside of our conscious awareness. To help illuminate his discovery, Freud used the analogy of an iceberg and told us that while we may be aware of a variety of psychological processes above the surface level, there are many more taking place in the unconscious waters below. While many of Sigmund Freud’s theories have been debunked by modern psychologists, his notion that there is an unconscious mind, where memories, cognitions, desires and perceptions reside, still holds weight in psychology circles today. In fact, nearly every therapeutic treatment strategy that’s currently popular will to some extent revolve around the premise that thought patterns found in the unconscious mind affect individuals’ behaviors, conscious thoughts, perceptions and overall levels of subjective well-being. Just as the Buddha deeply understood the psychological processes of emotional reaction and conditioning, he too had a keen insight into the inner workings of the unconscious mind. It is certain that through the practice of meditation, which the Enlightened One vehemently prescribed to anyone looking to progress spiritually, he came to observe how particular memories, thoughts, perceptions and desires remained outside of his conscious awareness. Moreover, the Buddha’s understanding of the unconscious becomes crystal clear when considering the fact that Buddhist scriptures make direct reference to a storehouse consciousness, called alaya-vijnana, that is home to past memories and perceptions which play a role in determining one’s everyday thoughts, behaviors and emotions. In addition to having a vast understanding of older psychological theories such as the ones we have thus far discussed, the Buddha’s supreme knowledge of human behavior and the mind can also be recognized when comparing his teachings to modern theories and therapeutic treatment strategies such as Cognitive Behavioral Therapy (CBT). It was during the 1960s when a psychiatrist at the University of Pennsylvania by the name of Aaron T. Beck, who was then treating depressed patients using psychoanalysis treatment techniques popularized by Freud, first conceptualized and devolved the philosophical framework of CBT. After conducting a number of experiments with hopes of verifying the effectiveness of psychoanalysis, Beck was shocked to discover that the treatment strategies weren’t positively impacting his patients at all. Coming to this realization, the now immortalized psychologist determined that he must improve his abilities to help his patients and ultimately began developing the foundational concepts of CBT. Today, the lauded therapeutic approach is considered by many to be the most effective at treating a wide variety of mental health disorders. While there is a wide range of concepts and treatment activities that we could look at to illuminate the Buddha’s understanding of CBT, we’ll stick to examining what is widely considered to be one of the most important. The CBT Triangle shows us how an individual’s thoughts, behaviors and emotions influence one another on a continual basis. This means that when a person thinks negatively, their behaviors and emotions are subjected to negative consequences, and when a person behaves unethically, their thoughts and emotions face similarly adverse affects. 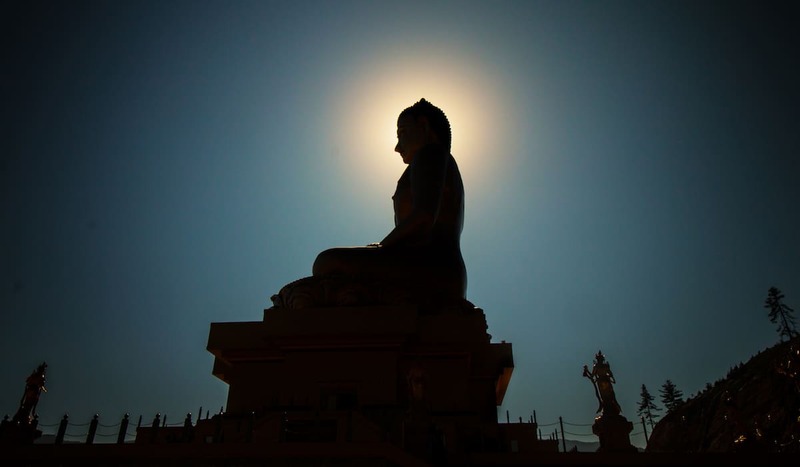 Even though Aaron T. Beck and other CBT pioneers are largely credited with conceptualizing this mind-body idea, there is little denying the fact that the Buddha clearly understood the interconnected nature of one’s thoughts, behaviors and emotions. Although it may seem unreasonable to think that the Buddha had an equally insightful understanding of the most notable psychological discoveries of the 21st century, because of advancements in medicine and research, that simple isn’t the case. It wasn’t until 2001 when a team of researchers at Washington University in St. Louis, led by neurologist Marcus E. Raichle, coined the term Default Mode Network (DMN) to illuminate the brain’s consistently high levels of neural activity. Thanks to technologically sophisticated brain MRI imagining equipment, researchers have been able to show that the DMN, which is responsible for self-referential daydreaming and mind-wandering about past and future events, is continuously active when a person isn’t focused on an outside task or sleeping. Since the work of Raichle and his team, prominent psychologists and neurologists have been able to link faults in the DMN to a wide variety of mental health disorders including depression, anxiety, ADHD, OCD, PTSD, Bipolar disorder, psychosis and Alzheimer’s. Yet still, it must be pointed out that the mechanisms of the DMN are indispensable for the human species and help us with social functioning, creativity and planning. It must be pointed out that nothing that’s been written in this article has been done so with the intention to take away from the work and discoveries of psychology’s truly immortal figures, rather it’s to shed light on the Buddha’s immense psychological understanding. Without question, the likes of William James, Ivan Pavlov, Sigmund Freud and Aaron T. Beck deserve all the credit in the world for the contributions they’ve made to the study of the human brain and behavior, but it may be unwise of ourselves not to dive deeper into the Buddha’s teachings with hopes of improving our own levels of subjective well-being. A really interesting and enjoyable article Thankyou. (You might want to change they’re to their in paragraph 2 of CBT part).